The graphical modeler allows you to create complex models using a simple and easy-to-use interface. When working with a GIS, most analysis operations are not isolated, but rather part of a chain of operations instead. Using the graphical modeler, that chain of processes can be wrapped into a single process, so it is as more convenient to execute as a single process later on a different set of inputs. No matter how many steps and different algorithms it involves, a model is executed as a single algorithm, thus saving time and effort, especially for larger models. 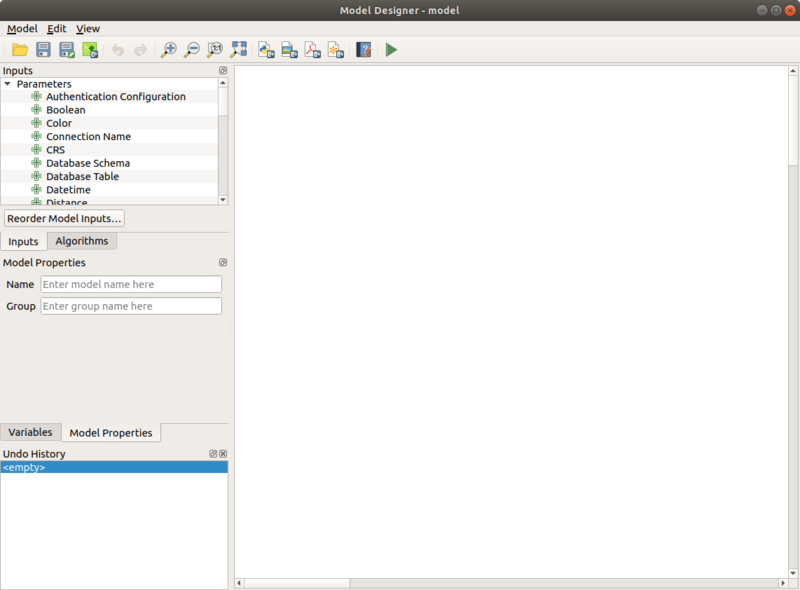 The modeler can be opened from the processing menu. 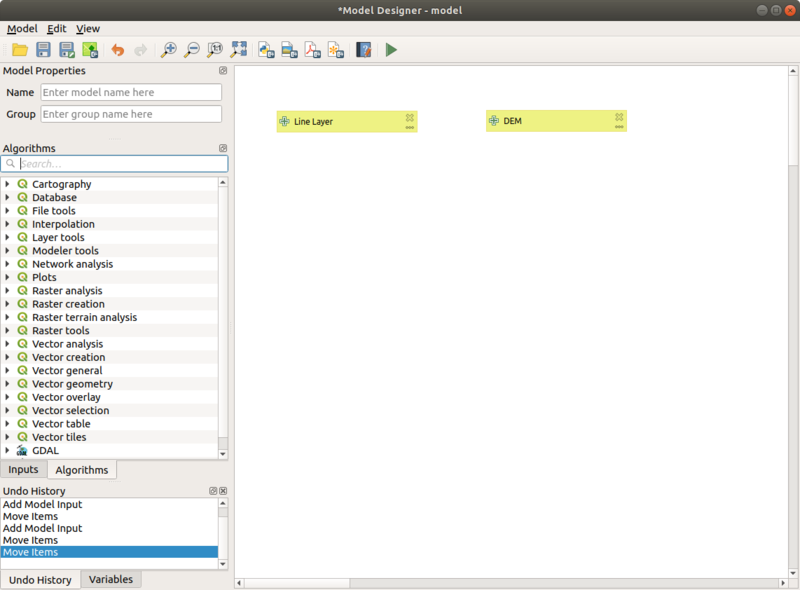 The modeler has a working canvas where the structure of the model and the workflow it represents are shown. On the left part of the window, a panel with two tabs can be used to add new elements to the model. Definition of necessary inputs. These inputs will be added to the parameters window, so the user can set their values when executing the model. The model itself is an algorithm, so the parameters window is generated automatically as it happens with all the algorithms available in the processing framework. Definition of the workflow. Using the input data of the model, the workflow is defined by adding algorithms and selecting how they use those inputs or the outputs generated by other algorithms already in the model. Double-clicking on any of these elements, a dialog is shown to define its characteristics. Depending on the parameter itself, the dialog may contain just one basic element (the description, which is what the user will see when executing the model) or more of them. 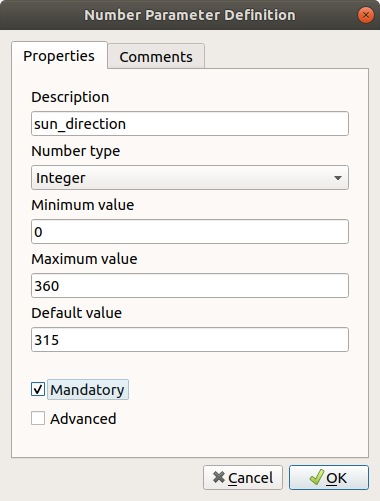 For instance, when adding a numerical value, as can be seen in the next figure, apart from the description of the parameter, you have to set a default value and a range of valid values. For each added input, a new element is added to the modeler canvas. You can also add inputs by dragging the input type from the list and dropping it in the modeler canvas, in the position where you want to place it. Once the inputs have been defined, it is time to define the algorithms to apply on them. Algorithms can be found in the Algorithms tab, grouped much in the same way as they are in the toolbox. 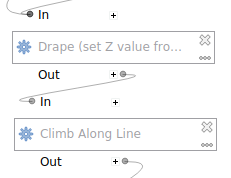 To add an algorithm to a model, double-click on its name or drag and drop it, just like it was done when adding inputs. An execution dialog will appear, with a content similar to the one found in the execution panel that is shown when executing the algorithm from the toolbox. The one shown next corresponds to the SAGA ‘Convergence index’ algorithm. As you can see, some differences exist. 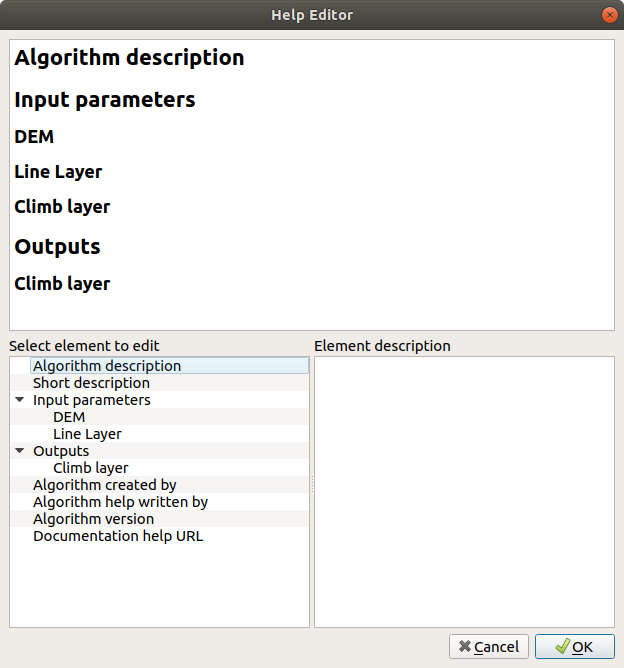 Instead of the file output box that was used to set the file path for output layers and tables, a simple text box is used here. If the layer generated by the algorithm is just a temporary result that will be used as the input of another algorithm and should not be kept as a final result, just do not edit that text box. Typing anything in it means that the result is final and the text that you supply will be the description for the output, which will be the output the user will see when executing the model. Selecting the value of each parameter is also a bit different, since there are important differences between the context of the modeler and that of the toolbox. Let’s see how to introduce the values for each type of parameter. Layers (raster and vector) and tables. 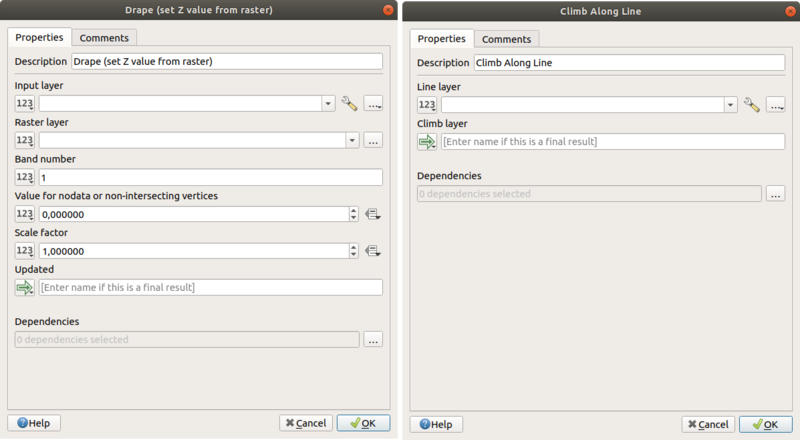 These are selected from a list, but in this case, the possible values are not the layers or tables currently loaded in QGIS, but the list of model inputs of the corresponding type, or other layers or tables generated by algorithms already added to the model. Numerical values. Literal values can be introduced directly in the text box. Clicking on the button beside the text box, expressions can be entered. Available variables for expressions include numerical inputs of the model, and also statistical values from available raster layers within the model. String. Literal strings can be typed in the corresponding text box. Clicking on the button beside the text box, expressions can be entered, as in the case of numerical values. Table field. The fields of the parent table or layer cannot be known at design time, since they depend on the selection of the user each time the model is executed. To set the value for this parameter, type the name of a field directly in the text box, or use the list to select a table field input already added to the model. The validity of the selected field will be checked at run time. In all cases, you will find an additional parameter named Parent algorithms that is not available when calling the algorithm from the toolbox. This parameter allows you to define the order in which algorithms are executed by explicitly defining one algorithm as a parent of the current one, which will force the parent algorithm to be executed before the current one. When you use the output of a previous algorithm as the input of your algorithm, that implicitly sets the previous algorithm as parent of the current one (and places the corresponding arrow in the modeler canvas). However, in some cases an algorithm might depend on another one even if it does not use any output object from it (for instance, an algorithm that executes a SQL sentence on a PostGIS database and another one that imports a layer into that same database). In that case, just select the previous algorithm in the Parent algorithms parameter and the two steps will be executed in the correct order. Once all the parameters have been assigned valid values, click on OK and the algorithm will be added to the canvas. It will be linked to all the other elements in the canvas, whether algorithms or inputs, that provide objects that are used as inputs for that algorithm. Elements can be dragged to a different position within the canvas, to change the way the module structure is displayed and make it more clear and intuitive. Links between elements are updated automatically. You can zoom in and out by using the mouse wheel. You can run your algorithm any time by clicking on the Run button. However, in order to use the algorithm from the toolbox, it has to be saved and the modeler dialog closed, to allow the toolbox to refresh its contents. Use the Save button to save the current model and the Open button to open any model previously saved. Models are saved with the .model extension. If the model has been previously saved from the modeler window, you will not be prompted for a filename. Since there is already a file associated with that model, the same file will be used for any subsequent saves. Before saving a model, you have to enter a name and a group for it, using the text boxes in the upper part of the window. Models saved on the models folder (the default folder when you are prompted for a filename to save the model) will appear in the toolbox in the corresponding branch. When the toolbox is invoked, it searches the models folder for files with the .model extension and loads the models they contain. Since a model is itself an algorithm, it can be added to the toolbox just like any other algorithm. Models can also be saved within the project file using the Save model in project button. Models saved with this method won’t be written as .model files on the disk but will be embedded in the .qgz project file. Project models are available in the Project models menu of the toolbox. The models folder can be set from the Processing configuration dialog, under the Modeler group. Models loaded from the models folder appear not only in the toolbox, but also in the algorithms tree in the Algorithms tab of the modeler window. That means that you can incorporate a model as a part of a bigger model, just as you add any other algorithm. Models will show up in the Browser panel , and can be run from there. A model can also be exported as an image, SVG or PDF (for illustration purposes). You can edit the model you are currently creating, redefining the workflow and the relationships between the algorithms and inputs that define the model itself. Selecting the Edit option will show the parameters dialog of the algorithm, so you can change the inputs and parameter values. Not all input elements available in the model will appear in this case as available inputs. Layers or values generated at a more advanced step in the workflow defined by the model will not be available if they cause circular dependencies. Select the new values and then click on the OK button as usual. The connections between the model elements will change accordingly in the modeler canvas. A model can be run partially, by deactivating some of its algorithms. 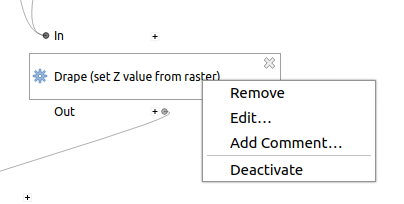 To do it, select the Deactivate option in the context menu that appears when right-clicking on an algorithm element. The selected algorithm, and all the ones in the model that depend on it will be displayed in grey and will not be executed as part of the model. When right-clicking on an algorithm that is not active, you will instead see a Activate menu option that you can use to activate it back. You can document your models from the modeler itself. Just click on the Edit Model Help button and a dialog like the one shown next will appear. On the right-hand side, you will see a simple HTML page, created using the description of the input parameters and outputs of the algorithm, along with some additional items like a general description of the model or its author. The first time you open the help editor, all these descriptions are empty, but you can edit them using the elements on the left-hand side of the dialog. Select an element on the upper part and then write its description in the text box below. Model help is saved as part of the model itself. You might notice that some algorithms that can be be executed from the toolbox do not appear in the list of available algorithms when you are designing a model. To be included in a model, an algorithm must have a correct semantic, so as to be properly linked to others in the workflow. If an algorithm does not have such a well-defined semantic (for instance, if the number of output layers cannot be known in advance), then it is not possible to use it within a model, and thus, it does not appear in the list of algorithms that you can find in the modeler dialog.